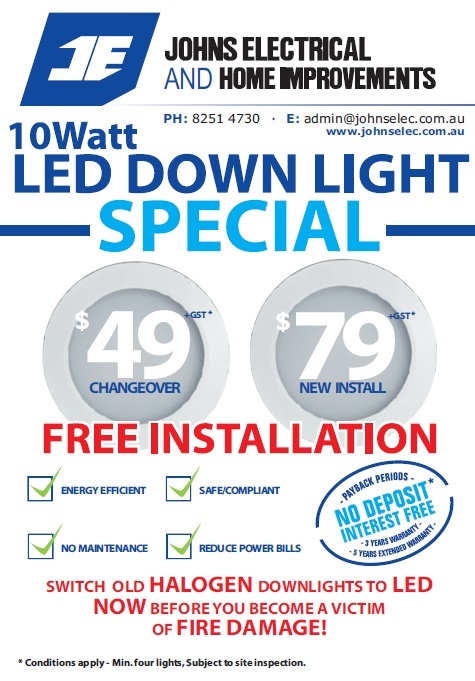 John’s Electrical supplies and installs quality LED downlights. Great savings for households and businesses. >LED down lights are the latest in energy efficient lighting. By changing over your old and extremely dangerous halogen down lights to LED down lights you can save around 80% compared to your current lighting electricity costs.LED Lights are much safer as they are solid state and do not get hot. Halogen lights produce a lot of light but they also produce a great deal of heat. LED Lights on the other hand are the most efficient lighting available on the market and produce only minute amounts of heat and therefore eradicate the risk of fire. LED down lights perform much better than standard down lights and give a much nicer light off which can really enhance the appearance of you house. They also have the advantage of being ideal for directional lighting, and as they run in banks can be highly controllable. LED lights are able to be dimmed. LED Lights have extremely good white light colour. Above all as LED Lights are solid state and have no “burning” their life is in effect forever. We are talking many years depending on the circumstances. No replacing, no ladders, no worries. Why are LED Downlights the lighting solution for today? This quality makes LED lights tailor made for Down lights and ideal for Spotlights. LED Lights are directional. Unlike Fluorescent lights (and the old incandescent lights), LED lights have a narrower range (about 450) so arrays of LED lights create a beautiful targeted lighting scheme and illuminate what matters. LED lights just do not need replacing! LED Lights have a lifespan of 35,000 to 50,000 hours. That means that if you have LED lighting on for 5 hours a day every day the LED lights will still be functioning at near peak power after 20 years or more! (Compact fluorescent bulbs have a maximum lifespan of about 8000 hours, Halogen less than half that, which means replacing after about 1.5 years or as we are sure you have noticed – even more frequently than that). Low safety hazard, low environmental impact, low carbon footstep. Halogen downlights by contrast may reach 2500 Celsius! LEDs will not exceed 400 Celsius. In summer this means your cooling costs will also be decreased and you will make additional cost savings. Put another way, LED Lighting shows dramatically reduced energy usage compared to all other lighting. Replacing your Halogen downlights with LED lights can reduce your lighting energy costs by around 80%. Even CFL lights (Compact Fluorescent lights) cannot match the efficiency of LED Lights. CFL and standard Fluorescent lights also suffer from decreased lamp life due to switching on and off and in the case of standard Fluorescent lights a slow response time to get to full light. A 10 Watt LED light produces the same amount of illumination as a 50 Watt halogen light. This means 5 times less energy used, 5 times more money saved on lighting bills and 5 times less harm to the environment. (approximate and conservative figures). The colour of LED Lighting for white lighting is generally superior to fluorescent lighting. Correctly installed LED Light give close to the white light quality of incandesant white light colour. Led lighting can also create a range of real colour effects. And many LED light configurations allow for the lights to be dimmed. The unit price of a LED Light is higher than the alternatives. However the savings in energy use are very significant. Most LED Lights will pay for themselves in energy savings in about a year and then continue to make savings every year for about 20 years. In some cases it may take two years to pay for themselves. Keep in mind that as electricity prices increase the savings for your LED Downlights also increase. Perhaps more important in the long run is the overall low energy use. LED lights are not brittle or fragile and use solid state technology, (LEDs use no breakable glass or filaments), so they are very durable and great for high-usage areas. No Mercury (CFLs and other Fluorescent lighting all use mercury). No UV emission and little infrared light. As a result disposal of redundant lights is not an issue. LED lights are very compact and so are ideal for recessed down light installation. We can honestly say that you have every reason to use the lighting solution of the future which is here with us now – in you home, shop, business or factory. Where your downlighting is difficult to access you will have the peace of mind that you will not need to reinstall for decades, that’s right, decades. No ladders, no electricians costs, no worrys. Our products have been chosen based on quality and price. LED lights are designed to work with your existing electrical systems and even older ones. Our electricians offer a very competitive price to install them for you.